There was a dull impact in the centre of his back. Mr. Nagaki looked down to see the tip of an arrow protruding from his chest. He spun - his claw fingers at the ready - to see figures emerging from the snow, charging towards him. One of them was notching another arrow in his compound bow. They'd buried themselves and waited for him. There were five of them in total, one had the bow and arrow, the others all had swords. Magic and explosions had failed Wu-Han, it looked as though he was now going to try dismemberment. Another arrow caught him in the throat, lodging itself halfway in his neck. 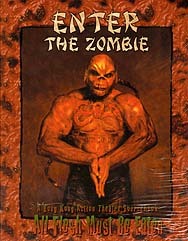 * Extended rules for martial arts mayhem, new Character Types, special chi powers, and new zombie aspects. * Zombie player character creation. * Adventures involving gun-slinging thugs on the streets of Hong Kong. * Background for stories set in ancient China. * An arena where undead battle to the death. * Archetypes for each setting provided.